« High Blean B&B, Bainbridge: Home Made Butter. Mill Gill water fall, which is only a short walk out of Askrigg, though can be walked from High Blean B&B at Semer Water, by those who enjoy a longer walk, is a much over looked beauty spot. 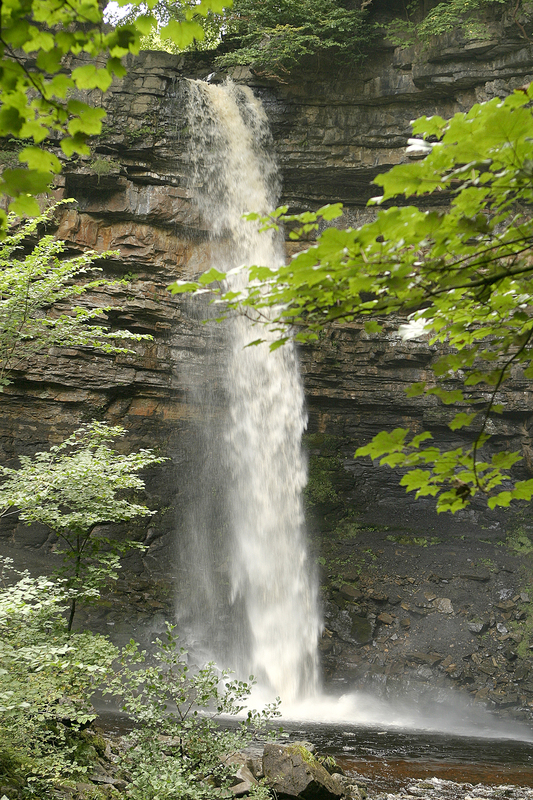 While most people who visit the area will know of, or at least will have heard of, Hardraw Force Water Fall [below], most will not have heard of the natural spectacle that is Mill Gill Water Fall. Mill Gill is an easy walk out of Askrigg and is very well signed with the path being clearly defined, so there are no special instructions needed to get there from Askrigg. 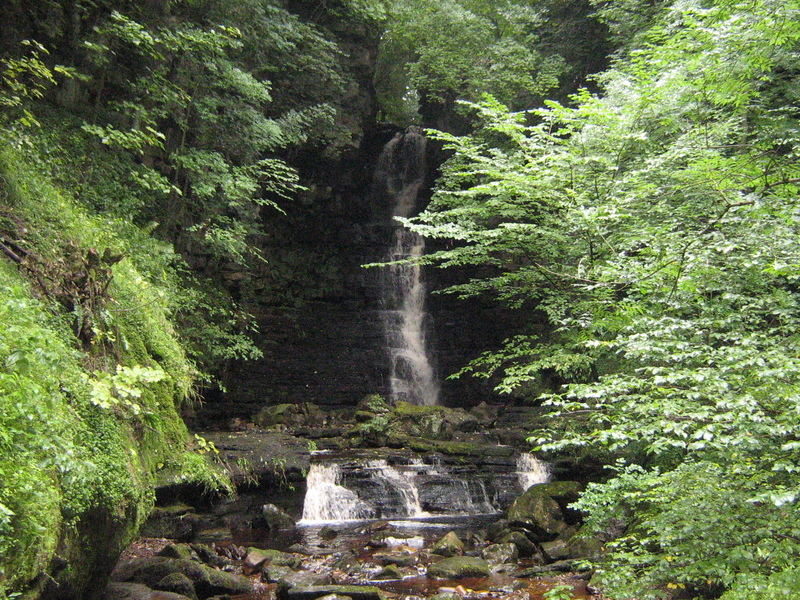 However, the water fall can be accessed from a number of directions, all of which follow public footpaths. It would be necessary to consult a map of the Askrigg area to determine the best route to follow or if wishing to make this a round walk or a detour from a longer walk. For those setting off from Askrigg, start from the cobbles in front of St Oswald Church. While facing the church walk down the road to the right of the church [Main Street] and this soon becomes Mill Lane. Just keep walking down here until the houses on your right end, then in about 50 yards you will find a sign on your right for Mill Gill, and a gate into a field. Walk across the field and then follow the path, which crosses the stream, over some deep and strangely menacing looking pools. The path climbs from here, but is not too strenuous, but appropriate footwear is essential. The whole walk to Mill Gill falls from the church is less that 3/4 of a mile and you will only have climbed just over 150 feet from the starting point by the church. When you get there, depending on recent rain fall, you will be met by a water fall, which, though not as high as Hardraw, is every bit as spectacular. We usually take the round trip by walking on towards Whitfield Gill, and take one of the paths that lead across to Low Straights Lane. Walk along this lane until it meets Moor Lane, turn right back down in to Askrigg. There are a number of paths from Low Straights Lane that lead back to Askrigg, but these cross fields that often contain cattle: given we have dogs, we do not take the chance of an encounter with cows and their calves. We sometimes end our walk with a beverage in the Crown Inn, in front of one of their fires. Dogs are welcome. This is a video clip of the whole walk, which we have been kindly allowed to use by “The Taxi Driver” who manages to spot lots of different plants, fungi and birds, and even manages to spot a cuckoo.